There are three things we love here in the Empire's PR Division: wasting company time on Facebook, Stormtroopers, and "sending other people to a better place". 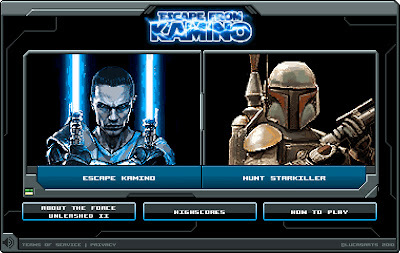 Thankfully, after months of development, the unfortunate and unexpected demise of several Testtroopers and a minor setback involving a vat of weaponised silken tofu taking over the lab for a few days, our evil R&D team Activision have finally come up with an activity that involves doing all of those things at once: the Escape From Kamino application on Facebook. Released in conjunction with the ridiculously good-looking-but-completely-unaffordable-on-an-evil-PR-team's-budget Star Wars: The Force Unleashed II, Escape from Kamino allows you to control the recently-awakened Starkiller clone as he attempts to do what every audience member wanted to do during Kevin Costner's Waterworld: get the hell off a planet consisting almost entirely of water and wooden actors. 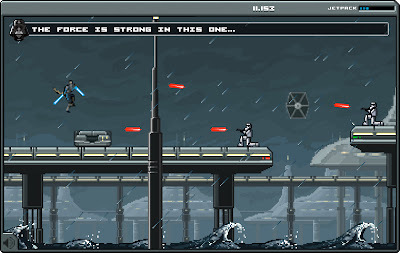 The 16 bit stylised side-scrolling game has the feel of a classic retro Star Wars game (think Super Star Wars on the SNES). 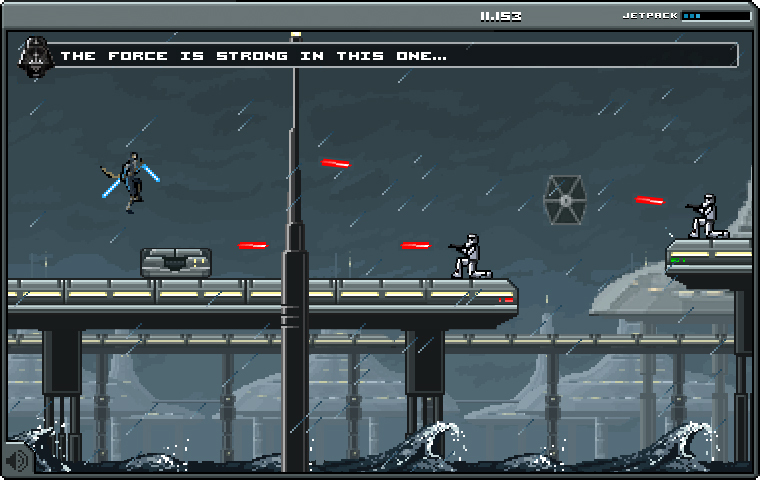 There are lots of little nods to classic Star Wars games as well as the Star Wars universe as a whole, and though it's simple to play, it's fun, fast and hard to master. As an added bonus, if you somehow get bored playing alone, you can kill challenge that annoying guy in the office friend you like to mastery of the Galaxy in 2-player mode. One player takes the role of Starkiller and the other mercilessly hunts him down as Boba Fett. And a million fanboys just... shivered with excitement.